The Wizard of Oz is one of those rare titans of cinematic history whose quality and reputation are so well-established that attempting to follow it up in any way seems to be a venture as fraught with peril as Dorothy’s quest down the yellow brick road itself. The Wiz, a musical remake of the story with an all-black cast, crashed and burned in the 1970s and Return to Oz, a sequel made in the 80s that focused on Dorothy’s further adventures, was a good film but is mostly known for traumatizing a generation of kids. But in this age of reboots and long-delayed sequels, inevitably someone would find that same courage the Cowardly Lion so desperately sought and try it again. It makes sense that the wonderfully demented and inventive Sam Raimi would be the guy to take on the challenge, grabbing bits from L. Frank Baum’s book series to create a vibrant, imaginative prequel that manages to work on its own merits while setting the stage for the story everyone knows. In place of a wholesome Kansas farm girl, our hero this time is Oscar Diggs, a magician in a traveling carnival who can hardly be described as great or powerful. While mystifying audiences with clever illusions and seducing young women to become temporary participants in both his act and his lovelife, he yearns to achieve something of importance. One balloon ride into a tornado later, he’ll get his chance when he is swept into the land of Oz, where the inhabitants all assume he’s the powerful wizard they’ve been promised will come to serve as their king… provided he can defeat the wicked witch who murdered the last one. Raimi is renown for his visual style and energy and he unleashes both in full force, playing on a canvas even bigger than that of his Spider-man films. As realized here, Oz is a glorious, colorful swirl of wonder and danger where the most nonsensical elements can co-exist perfectly, the kind of cinematic playground Raimi is best in. Fans of his low-budget days will recognize some of his old tricks, such as his trademark tilt zoom or the use of random noise to inspire fear in the characters (and the audience), but his more recent blockbuster work has let him perfect some new tricks both visually and aurally. A good example is a sweeping shot around Oscar as he first comes ashore in Oz that introduces us to the strange local flora and fauna while the sounds they make coalesce into a natural symphony. The film seems positioned to serve as a prequel to both Baum’s original book and the 1939 film, incorporating familiar pieces of both. One of the most notable aspects of the original film, the transition from black and white to color, is expanded upon here to also incorporate a change in aspect ratio, as the 1.33:1 shape the original film was shot in opens to 2.35:1 once we move to Oz. The smaller shape also allows some 3-D effects where objects fly beyond the border of the screen, which is much less jarring here than when it’s done in other 3-D films. Overall the 3-D is well presented and nicely enhances the depth of compositions though we do get perhaps a few too many scenes with things flying right at camera, among them flying baboons. As if the flying monkeys weren’t scary enough before. 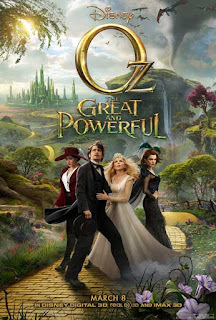 On the script level, the film manages to balance the prequel/literary/film elements well, offering nice little allusions to some of the characters and situations that appear in The Wizard of Oz without stopping the film cold to point them out. There are some awkward bits of on-the-nose dialogue that verbalize a lot of the thematic points the audience could mostly intuit, but given that much of that audience is bound to be children, that’s easily forgiven. More problematic is some of the narrative confusion regarding Oz’s most famous denizens, the witches. In an effort to keep some beats in the story a bit less obvious, the relationships between the witches themselves are a bit muddled and their characters not as sharply defined as they might have been. This is perhaps most distressing with the good witch Theodora (Mila Kunis), arguably the most interesting of the three. As we see her burgeoning attraction to Oscar, she comments on how she’s never received such attention from any man before, but given how absolutely luminous Kunis is in the role, we share Oscar’s incredulity regarding this. A bit more fleshing out on this plot point might have strengthened her character, especially given the arc she will go through. As her sister Evanora, Rachel Weisz again displays what a pro she is, effectively elegant and manipulative as she comes to see that Oscar isn't who he claims to be but might be useful in other ways. Meanwhile, as played by Michelle Williams, the ethereal Glinda is happily not reduced to the type of bland do-gooder that Anne Hathaway seemed to be spoofing in Tim Burton’s Alice in Wonderland. She is powerful but also pragmatic, as keenly aware of Oscar’s shortcomings as she is that he’s all she has to work with if she’s going to save her people. As for the Wicked Witch herself, the film takes a page from Wicked and presents her as a tragic figure, though perhaps not as sympathetically or effectively as in the musical. However, we do get a rationale for her cold-heartedness that makes the mayhem she’s set to unleash that much more affecting. Seventy odd years after Margaret Hamilton first scared kids around the world, it can’t help but give you chills to see the character rocketing about on her broom, screeching that signature cackle. On a side note, for those who keep track, the movie passes the Bechdel Test with flying colors. Despite his past association with Raimi from the Spider-man movies, Franco is an unorthodox but apt choice to play the sleazy illusionist. Allegedly both Johnny Depp and Robert Downey Jr. had been sought for the role but Franco really seems the best choice giving both the mischievous antics he’s become known for offscreen and his skill at suggesting the inner turmoil in his characters, qualities that merge nicely here. Oscar is a cad and a fraud and seems to accept that being so is a necessary trade-off if he’s ever going to achieve anything of worth, but we can sense his discomfort when faced with the disparity between the man he thinks he is and what others, whether they’re his stage show audience or the inhabitants of Oz, want him to be. 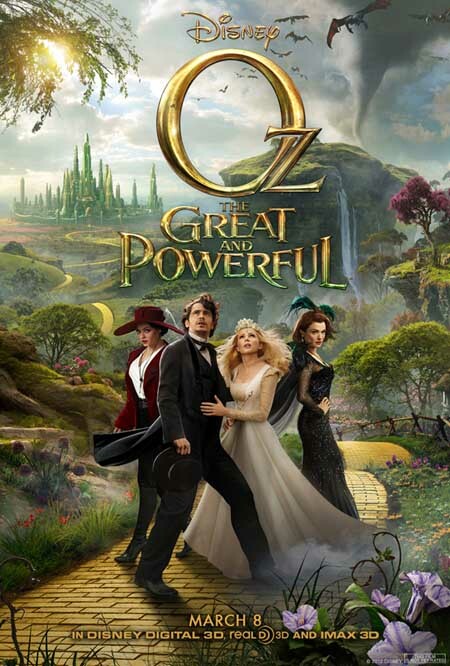 These elements of Oscar’s character are nicely drawn out by his fantastical companions, Finley the winged monkey (voiced by Zach Braff) and a girl made of porcelain (voiced by Joey King), who emerge as the film’s highlights, both as well-realized visual effects and fun characters. In addition to getting two absolute laugh-out-loud speeches, Finley comes to serve as Oscar’s conscience, pushing him to come clean to everyone about who he is, as well as representing all the people Oscar may have stepped on in his quest for fame and fortune. But Oscar’s relationship with the porcelain girl serves as the real key to his character, as her courage and fragility forces him to drop his self-absorbed exterior, act on the compassion that’s buried beneath, and try to make amends for the other women he’s left broken in his wake. Indeed we see through the film’s events that the way Oscar has mistreated others has lasting consequences that can’t be fixed with a magic wand. The film can also be viewed as a paean to the magical power of filmmaking. Like Oscar’s illusions, films are tricks devised through ingenuity, realized through technology and delivered with showmanship to make the audience believe in something more than reality. Raimi and crew seem to suggest that’s a form of greatness that can be powerful as an army. Unlike in Burton’s film, where Alice was awkwardly and uncharacteristically transformed into a sword-wielding warrior, Oscar doesn’t have to pick up a weapon to become a hero. Sometimes having a vial of crazy glue and some flowers up your sleeve is enough. And to answer the question on everyone’s mind, yes, the great Bruce Campbell, who has endured plenty of abuse at Raimi’s hands while appearing in his films, makes a fun cameo here where he gets repeatedly beaten with a stick. Happily some things never change, even along the yellow brick road.